To prevent them from getting lost, with permission of the sender, I would like to share them on this page. 9Q-CUK is C-47B c/n 16697/33445 of Vallentuna Aviatörförening / Ake Jansson. Previous identities include: 44-77113, N99665 and 9Q-CUK. It was flown for Transport Aériens Zaïrois and reported at Amsterdam-SPL in Nov91 & Jun96, equipped with a luxury interior. Due to the unrest in Zaire it found a home in Sweden. It was reregistered ES-AKE (Ake Jansson) during 1999 and was reported in Copenhagen in Oct03 to participate in a movie. It arrived in Spain's PMI-San Bonnet on 17Aug05 o.b.o. 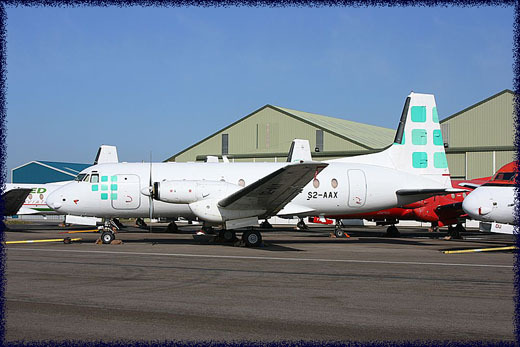 Lenz Power Int'l with the intention to operate passenger flights: Fly LPI. But official approval was never granted from the Spanish authorities. It abandoned Palma de Mallorca's sunny climes and arrived on 11Sep06 at Vallentuna (Sweden): home again. It has been registered 9Q-CUK again since 2007. 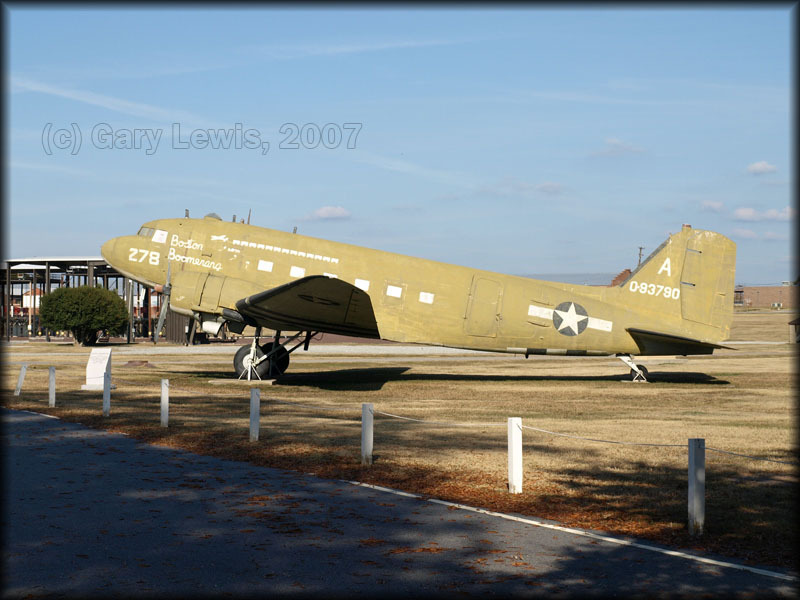 Gary Lewis sent me these 3 pictures of 42-93790, C-47A-25-DK at Ft Benning,GA (taken 10Dec07). 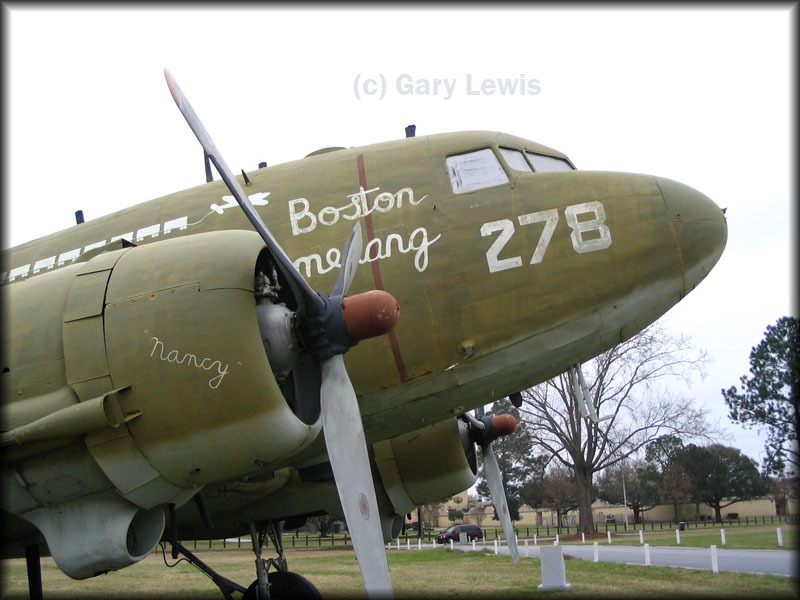 This Gooney Bird has been preserved here at the US Army Parachute Training School since 1970. 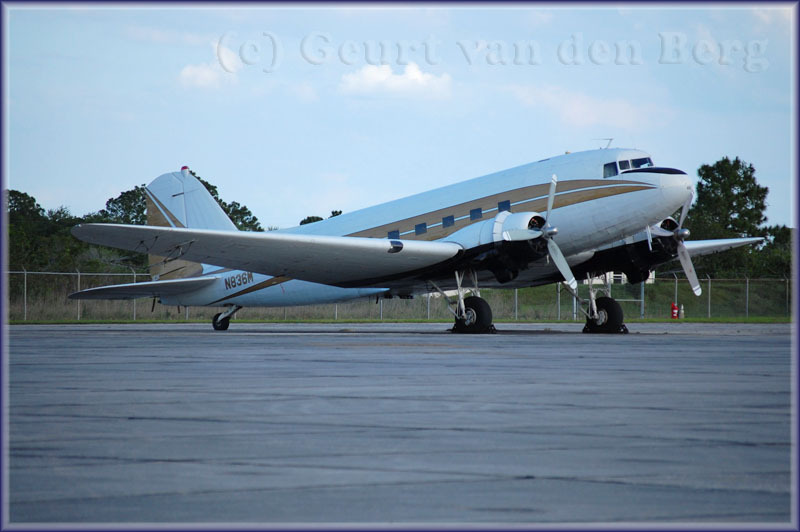 "Having discovered this DC-3 (42-92867) in the grounds of a school in Bogota, where it has been for the last 25 years, can anyone throw any light on its complete history?" 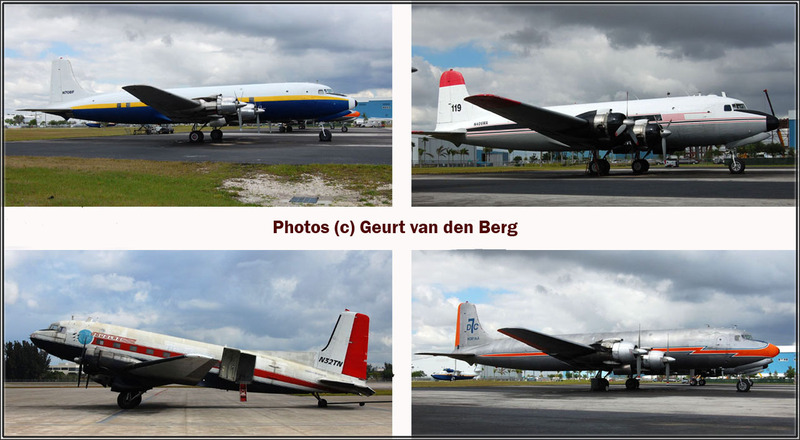 Online database www.aerotransport.org ties 42-92867 to c/n 12715 with the remark 'ultimate fate obscure'. 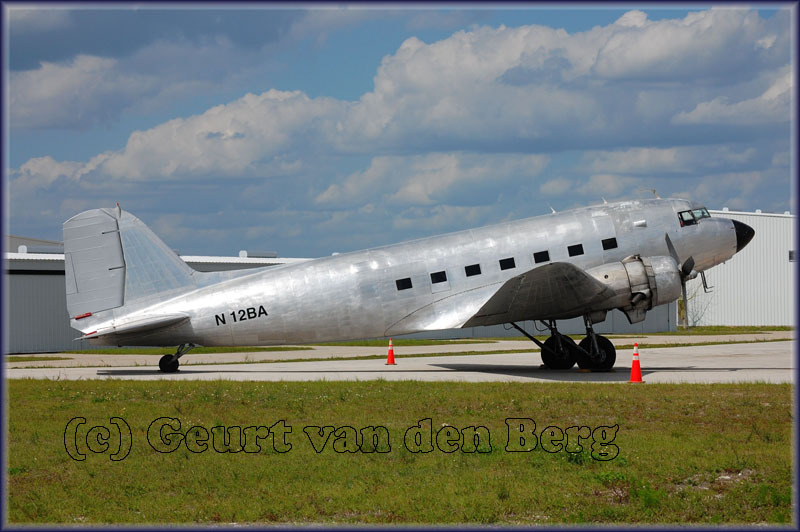 Air-Britian's book on the DC-3 revealed "C/n 12715 42-92867, delivered on 09Mar44 and served with the 8th and 9th AF in Europe that year and went back to the US the following year. It went to the Mexican Air Force on 19Sep47." Is this 42-92867 to begin with? Michael Prophet forwarded a photo of the construction number plate, made by Javier Franco "Topper", which confirmed its identity. 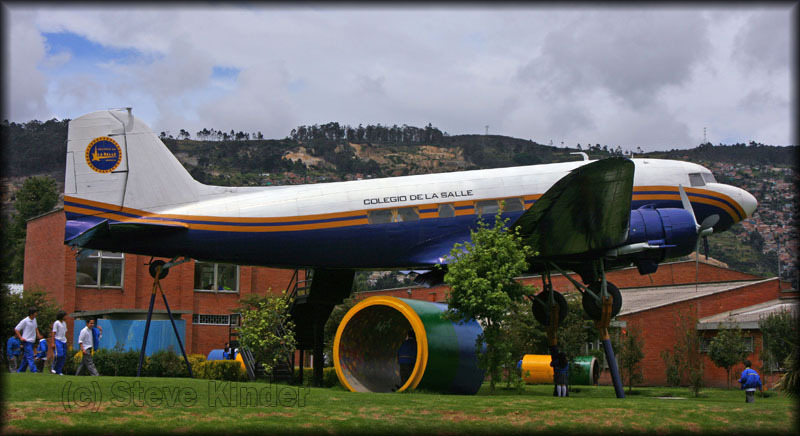 Except it didn't..
"Local aviation enthusiasts knew about a DC-3 at a school in a northern suburb of Bogota, Colombia. In April 2008 Javier Franco visited the Colegio La Salle to photograph it and check its ID. 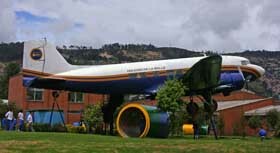 The airplane has been painted in the colours of the school and the interior is now a class room for young childeren. There was still a construction number plate installed in the airplane. This revealed the ID as 42-92867, checking the books and databases gave it cn 12715. 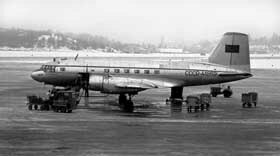 A positive ID, although cn 12715 was last reported as transferred to the Mexican Air Force in 1947. 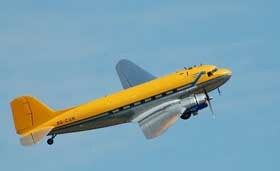 It sounds very unlikely that a DC-3 airframe would have gone unnoticed for over 60 years, without leaving any trace. 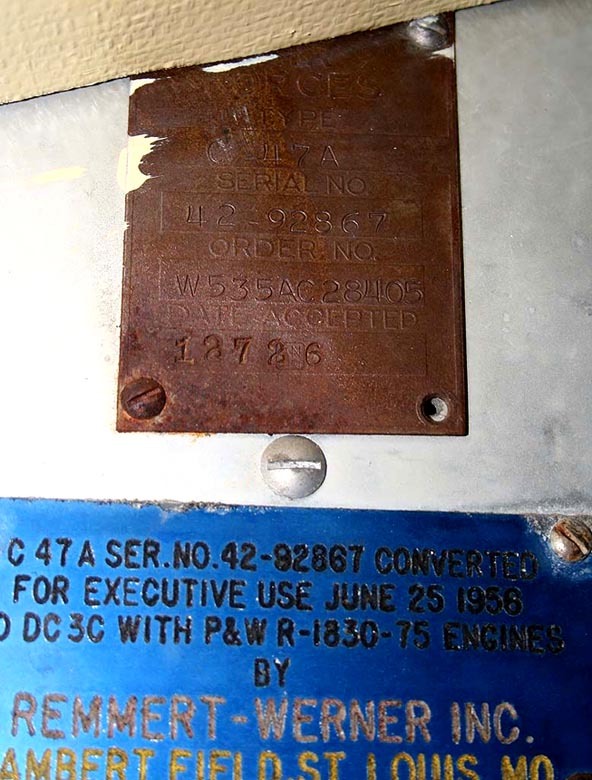 During intense research a closer look at the cn plate revealed the production date, 12726. No mather how you look at it, that cannot be a calender date. 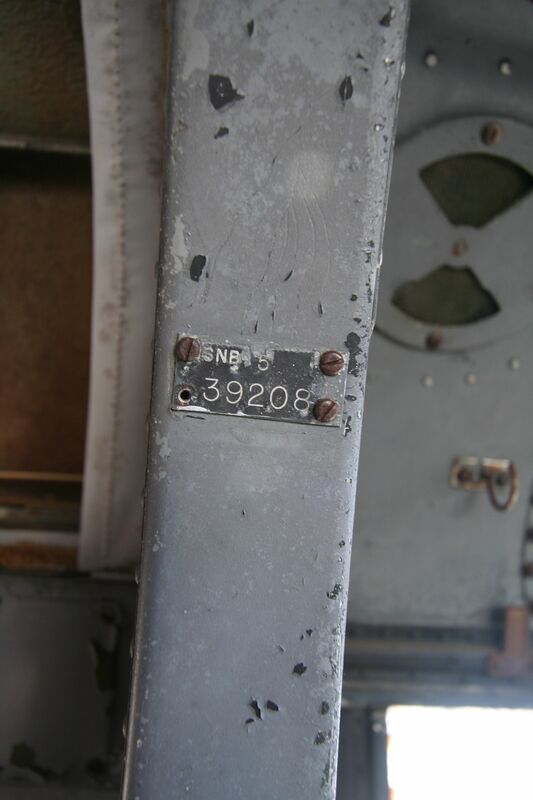 Now this is however a DC-3 construction number with a questionable history. Cn 12726 was delivered to the American Forces as 42-92877 and was noted operational until approximately 1970, often flying in Europe. But in 1956, (incorrect) 12726 was put on the civil FAA register as N47F, while the authentic militairy C-47 was still flying at that time. 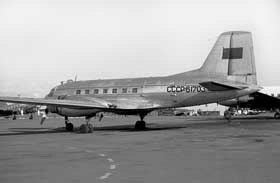 It looks like Romulo O'Farrill, a media entrepeneur in Mexico registered this DC-3 (cn 12715) on 21 February 1956, using the the wrong data. He used the number 12726, not 42-92867 or 12715. The FAA never corrected this number and kept using it. Soon after it became N47F the airplane was converted to executive configured DC-3C with Viewmaster window. It was reregistered to N75T and was used by Dow Chemicals and Brown Oil tools. In the mid-1970s the airplane was bought by LKB Research, who fitted a MAD boom to the tail section, for aereal survey. Their survey work took them to Colombia as well. It is unclear what happened after that. We only have an entry of a company called Manufacturers Trust Co. Inc. of New York (NY) on 24 February 1981. We believe it was soon confiscated by the Fuerza Aerea Colombiana... for whatever reason.... It was then donated by the FAC to the school in the north of Bogota. 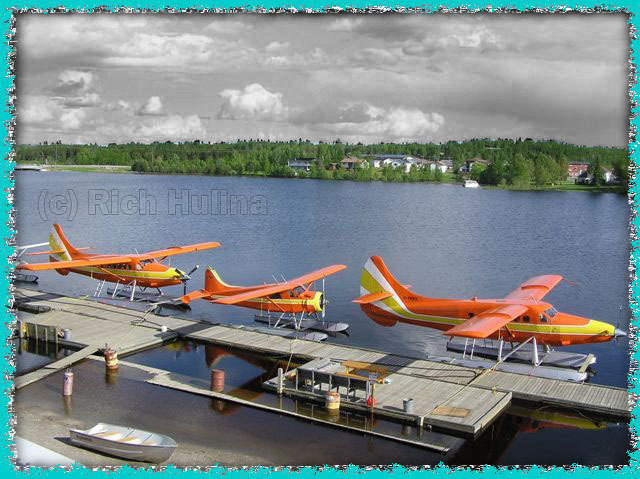 In Sioux-Lookout to be precise, with Rich Hulina's Slate Falls Airways to be even more precise!
" C-FCZP finally arrived a few weeks ago and can be seen here with it's sister ship C-FNWX!" 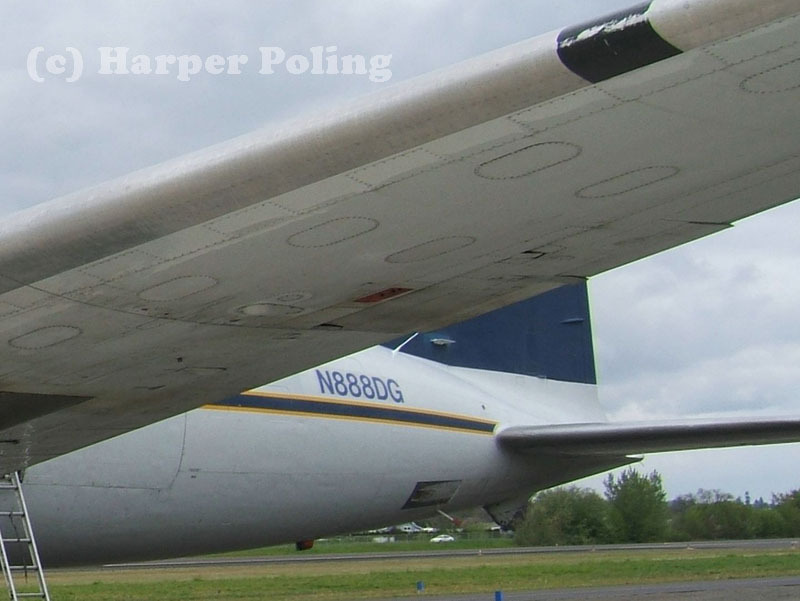 Top, left to right: N70BF (C-118B, c/n 43720) and N406WA (C-54G, c/n 35944). Bottom, left to right: N381AA (DC-7BF, c/n 44921) and N32TN (C-117D, c/n 43301). 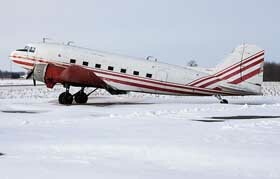 N32TN: I had come across this Super DC-3 in 2003, in Alaska with a previous owner. An extensive report about Propliners at Opa Locka can be read on Michael Prophet's website. But it seems that Hurricane Irma destroyed N32TN in Sep.2017; see my Photos by Friends & Guests (51). 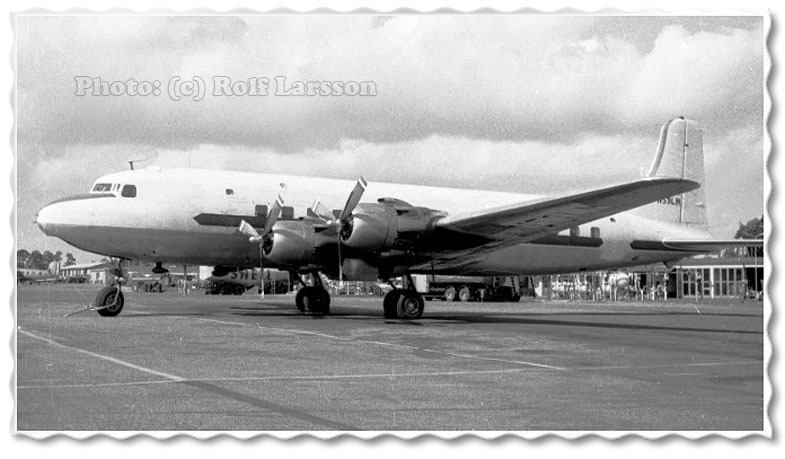 Rolf Larsson wrote me: "I have black and white negatives of this DC-6 taken at Bromma... "
He added: "On 21 January 1959 SAS DC-6 SE-BDO Arngrim Viking was performing a number of training flights at Visby on the island of Gotland, off the Swedish eastcoast. During one of the touch-and-go´s the landing gear was being retracted wrongly which caused the nosegear to retract and the aircraft skidded along the runway and ended up close to the runway end. At the same time SE-CAT, a Gloster Meteor of Svensk Flygtjänst, was approaching the field but as the runway was blocked by the DC-6 the Meteor made a go-around. 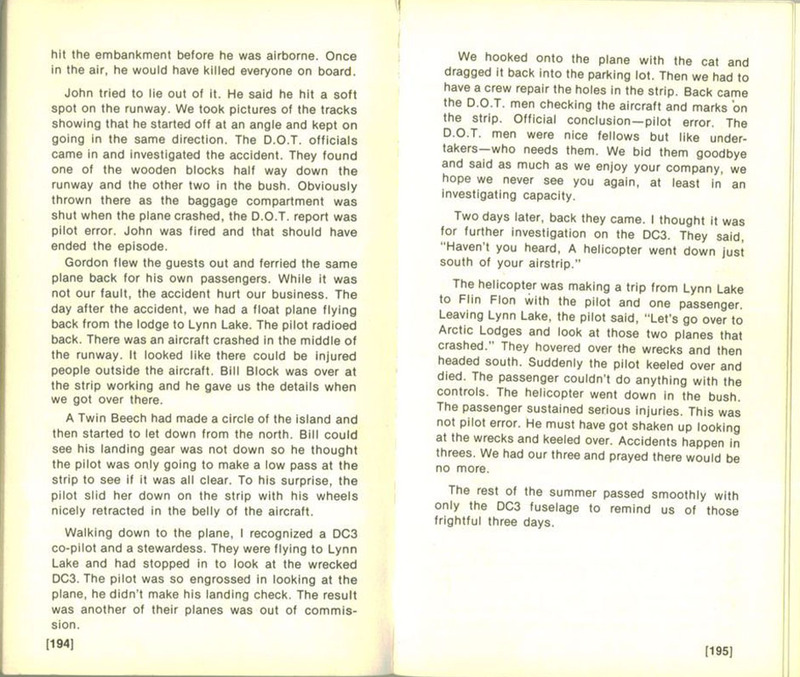 As the Meteor was short of fuel, not having enough for a diversion to the mainland, it crashed with the loss of the pilot and the passenger which was the airport manager for Visby airport. 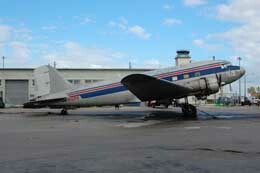 The DC-6 was temporarily repaired and was ferried to Stockholm-Bromma airport and, as can be seen on the pictures, awaiting final repairs (nose-wheel doors are still missing) with all SAS markings overpainted. It was subsequently sold to Lee Mansdorf & Co. to become N59LM, registration painted on the aircraft but, to my knowledge, not officially registered. The aircraft was repaired and instead sold as SE-BDO to Transair Sweden and was in service until sold in 1967." 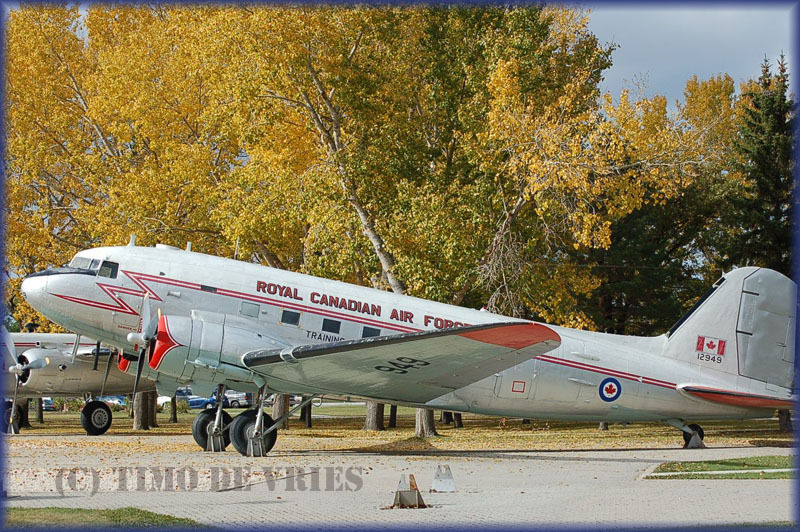 Timo de Vries sent me this colourful photo of CC-129 Dakota 12949 (c/n 14803/26248), preserved at Winnipeg CFB, taken during his visit in Sep.2007. 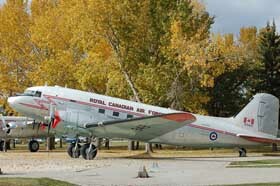 I was in the area too, around that time, and while I did not went to see the preserved aircraft at the Winnipeg CFB Heritage Park, I did see a large selection of 'propliners' and bushplanes during an extensive roadtrip... Go SEE ! 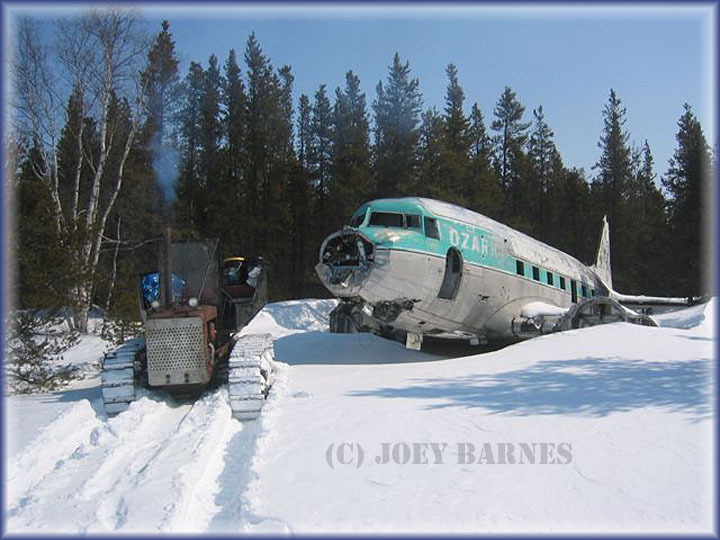 Joey is planning to recover this DC-3, "I have made two trips to the island runway so I know what it is going to take to get the DC-3 out and home to the KINGDOM!" 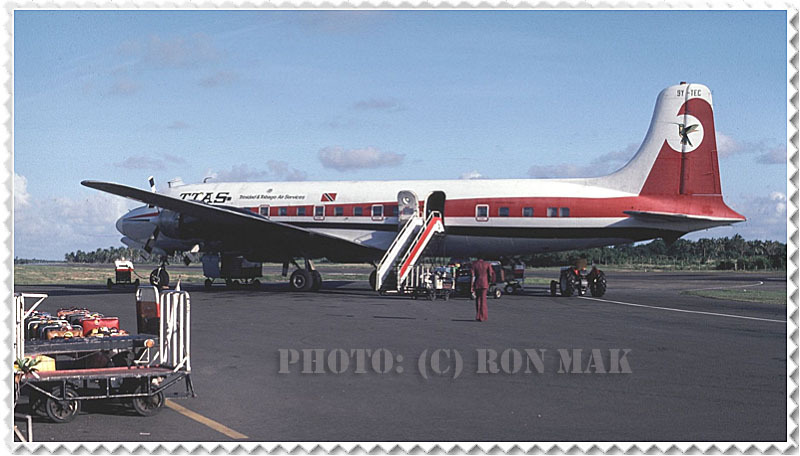 "I found this DC-6 photo among my collection; the photo was taken at Tobago Island and this was the passenger line service from Trinidad to Scarborough Airport: flighttime all of 40 minutes! This was in October 1977, memories..."
"Luckily this was my last shot on a Kodachrome KM-25 roll; during the returnflight to Port of Spain ( Trinidad) I changed film and shot some photos on the new film after landing at Port of Spain (a DC4 freighter had pulled up next to our DC-6) but then a police officer came up to me and I had to hand over my film! This must have been the first and only time I lost a film to the police. Good thing I had put away that other roll of film well out of sight. Only then did I notice signs which said photography wasn't allowed, in spite of a lovely promenade -so well suited for photography- from where I had shot a Cubana DC-8, a Caribwest L-188 and some other stuff, before my initial departure. 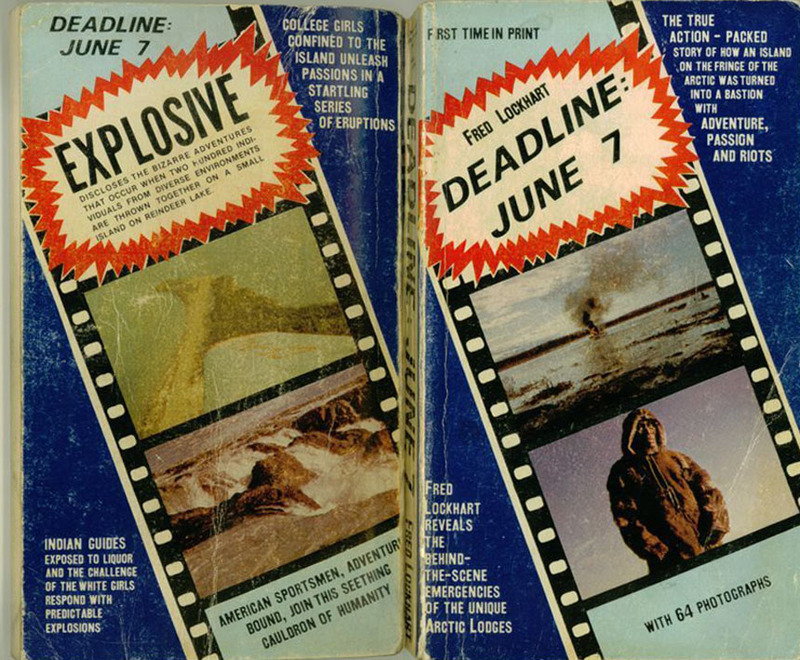 Good thing that film was safely tucked away in my suitcase!" 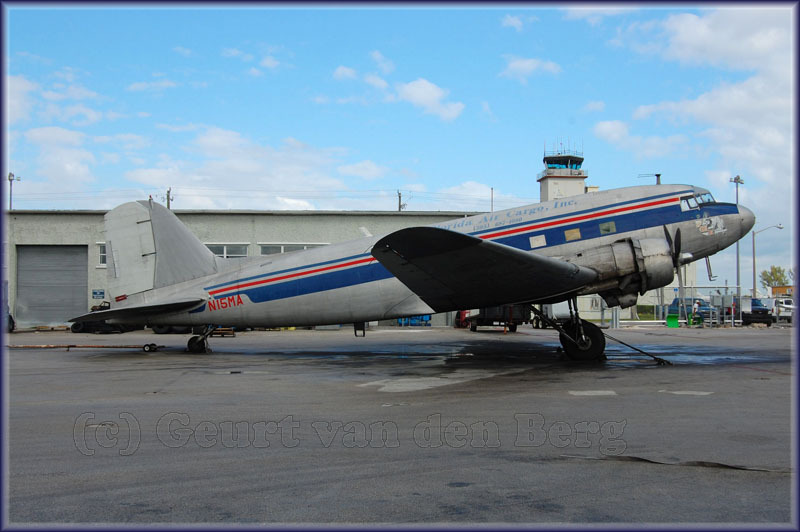 Background on this DC-6B 9Y-TEC: c/n 45538, delivered to Western Air Lines as N93133 on 30sep58, stored at Denver,CO in Aug68 - bought by Concare Aircraft Lsng Corp during 1969 - bought by Fortuna Inc in 1970 - purchased by Passport Air in 1971 - bought by Trinidad & Tobago Air Svcs during 1974 and reregistered 9Y-TEC- to Lloyd D.Culbertson in dec78 - as N93133 to Petroleum Air Transport in aug79 - reported 'without further use - wfu' and used for spares at St.Louis, Missouri during aug79; broken up dec80. "Somewhere in your website I saw a picture of a plane in Sharjah UAE. I spent some time flying there and a friend took me to an old abandoned airport. The city just swallowed it up... 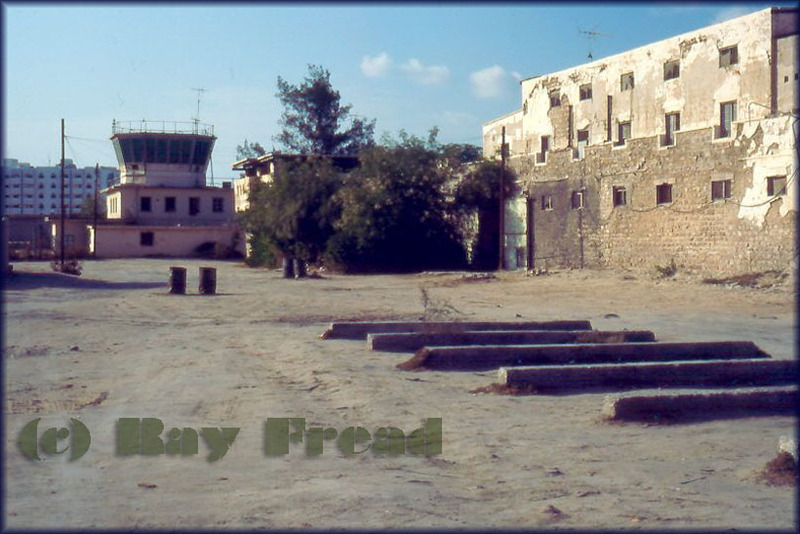 There were people living in the tower and the airstrip became a road and parking lot.! 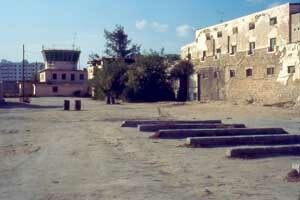 This was once also a fort, where passengers would overnight protected by armed guards. 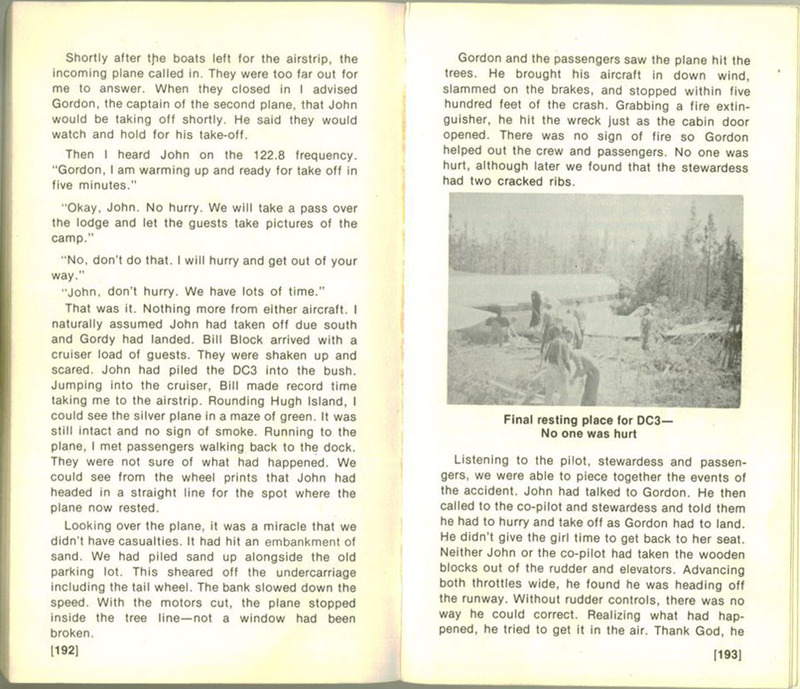 The friends name was Captain John Nowell and he was a helecopter pilot; he was also a very good photographer. He was the ops manager for a company called 'Citylink', which I was the first pilot for. 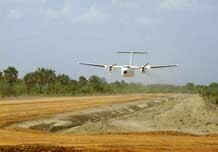 We used amphibian Cessna 208 Caravans and our only established route was Abu Dhabi to Dubai. The company has since collapsed, but has been restarted a few more times,. The latest and still going is called Seawings. 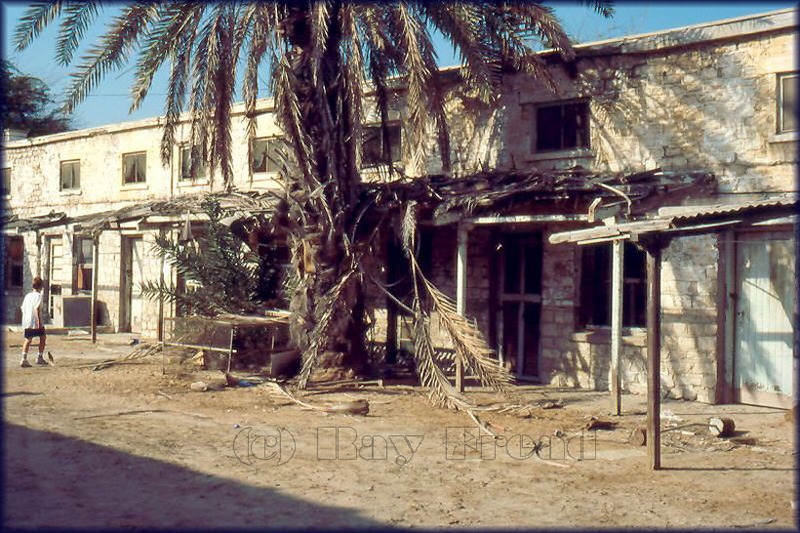 John Nowell is still in Dubai and he has a website where he promotes his many books." 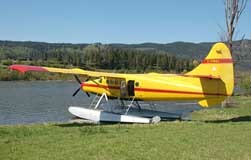 The Noorduyn Norsemanis my favourite bushplane and Martin triumphantly wrote: "Someone has a Norseman here in Bethel! I saw it flying around yesterday and I finally went down to the lake to take pictures of it. Here you go!" 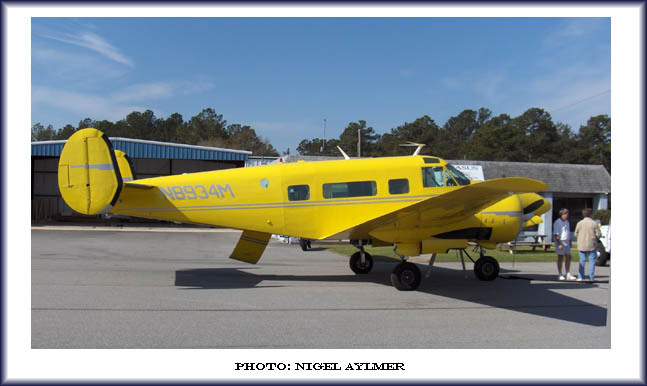 N225BL was registered to Thomas J.Gayer of Cooper Landing,AK on 27Jan04. Martin 'JoeJoe' Prince Jr sents me photos from time to time, mostly taken in Alaska where he lives. In 2016 I came across a note that it was being rebuilt by Jeff Brooks. But in 2018 it was confirmed to me that scrapped remains were still in open storage at Bethel. "I finally managed to get a picture of a new local resident... 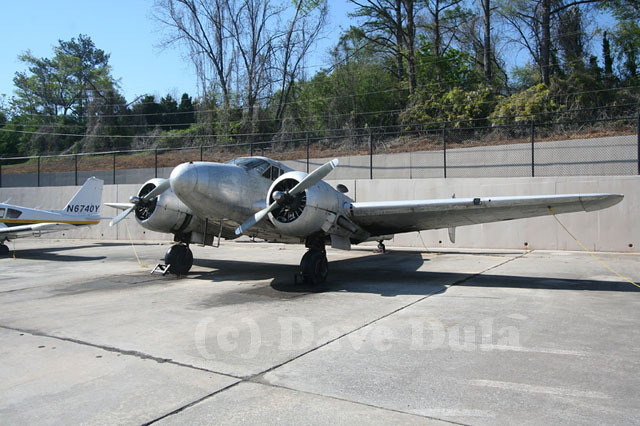 It is a Beech 18 based at Statesboro-Bulloch County Airport (KTBR),GA. The picture was taken there on 22Mar08." 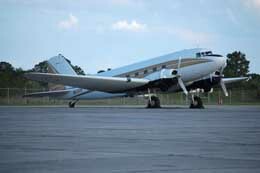 N8934M was registered to HAT Aviation of Statesboro on 03Oct07 and this Beech H-18 has c/n BA-664. While I have this information from the FAA website ('N-number inquiry', 09Jun08), it also provided a pending change to tailnumber N664PP. Other details included: equipped with P&W R-985 engines, aircraft date of manufacture: 1964. 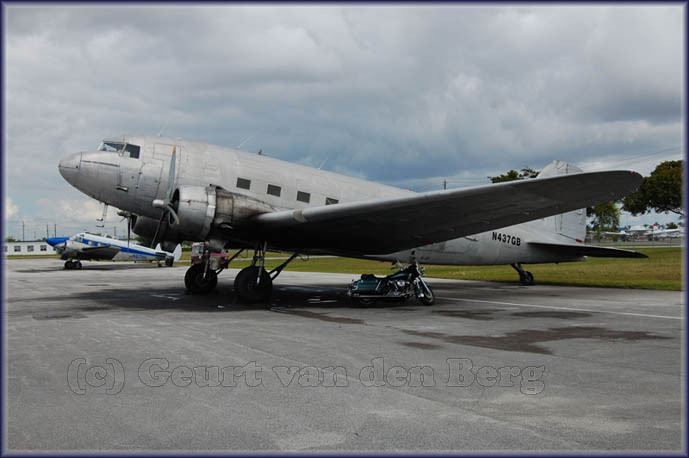 Douglas C-47A c/n 19999, former HR-LAD, is N437GB. 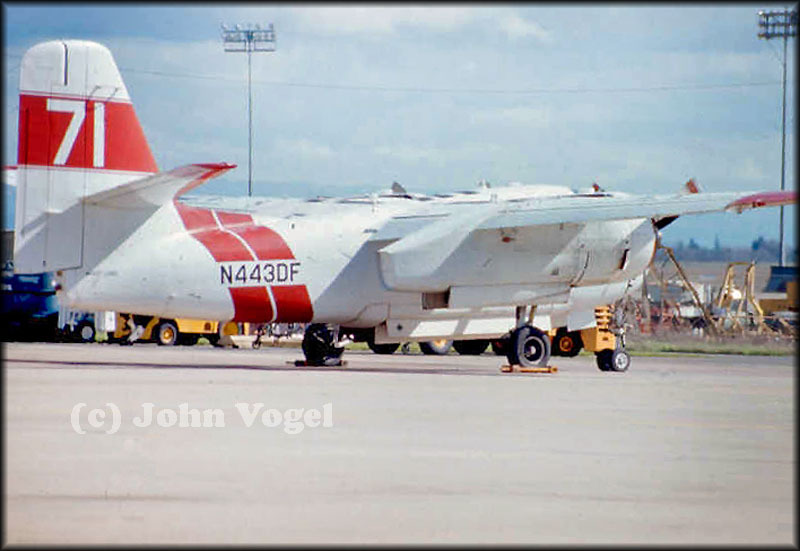 It had been stored at La Ceiba,Honduras for at least 5 years, but found its way back again to Florida where it was reported at Miami on 28feb98 as N437GB. It has been registered to Atlantic Air Cargo since 31Mar06. N437GB is seen here on 11Apr08 at Opa Locka, Florida. 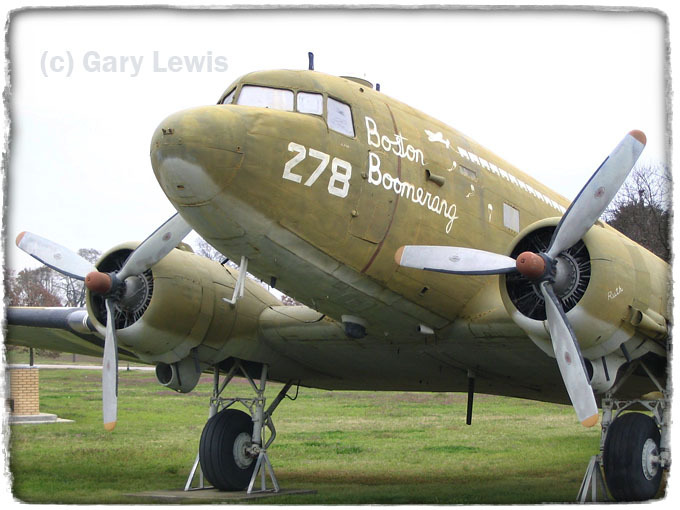 This is Douglas C-47A-50-DL c/n 10035. This former N12BA of Viking Express and before that it carried tailnumber N55LT. During 1997 it was reported at Aurora,IL for sale from Viking Express. On 11Apr2000 it was registered to Aviones Inc (a Delaware registered company). At some point it was reported to have been broken up at Aurora, but then it was reported (oct04) at McAllen,TX in ownership of Southwind Airlines and in good condition. 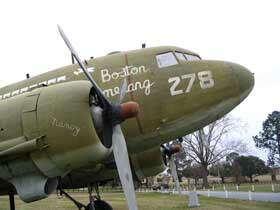 McAllen was homebase for at least 2 years and on 22Feb07 N12BA was registered to Harbock Inc. (of Wilmington,DE). Yesterday's Wings Inc (again of Wilmington,DE) had it registered to its name on 01Feb08. Its use (commercial? preservation?) is not clear to me. N12BA is seen here on 10Apr08 at Charlotte County Airport. It has been registered to South Florida Leasing since 03May96. 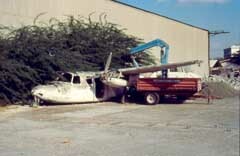 N15MA was damaged 17feb99 upon landing at Nassau,Bahamas but this proofed to be not fatal for this classic skytruck. Geurt encountered N15MA at Opa Locka on 11Apr08. N836M is C-47B with c/n 14532/25977. It was, and still is, registered for Lee County Mosquito Control on 28Jul75. This photo was taken on 10Apr2008 at Lehigh Acres / Buckingham,FL. N8WJ is a true Douglas airliner: DC-3A-456 c/n 9276. Geurt photographed it on 12Apr08 at Fort Lauderdale Executive. It was quite recently, 06Aug07, registered to a new owner: World Jet of Delaware Inc. Strange name for a DC-3 operator. This classic transport carried such exotic registrations as ETM-6042, FAM-UNO, XB-UNO and XB-JSJ. 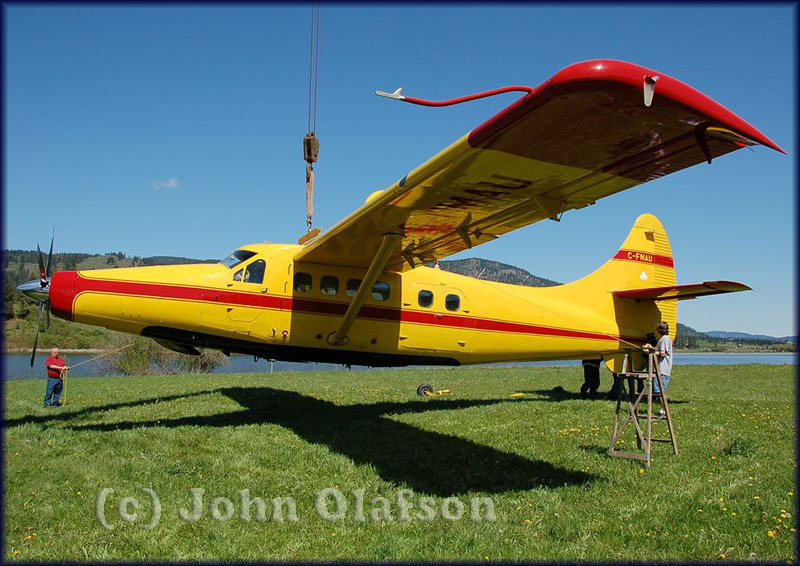 John wrote: "15May08 I was given a ride in Max Ward's Otter on a flight which would take us from Vernon to Otter Lake, a short distance north of Vernon,B.C. Before we left the Vernon area, pilot Dave Crerar did several short field stop and go's at Vernon to prepare for the very short strip we would be landing on at Otter Lake. The power and performance of that Otter with the Garrett engine is really spectacular! After a few circuits we flew to Otter Lake and made one pass around the very short strip there and Dave put it down perfectly. I got out and positioned myself to take some photos of Dave doing some takeoffs and landings and finally it was parked at the side of the lake, the crane came and lifted it up and the wheels were removed and the floats were installed and it was placed at the edge of the lake where she sits until some day this week when it will be flown to Campbell River for some weight/cg checks and flight certification testing." 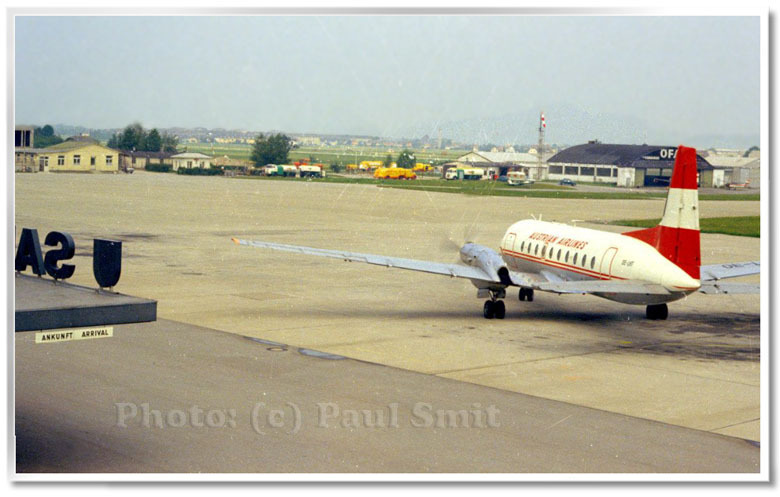 Paul Smit sent me this image, taken at Salzburg,Austria in 1968; the HS.748 is OE-LHT (c/n 1590) which later went on to Philippine Airlines and has been reported to be destroyed. 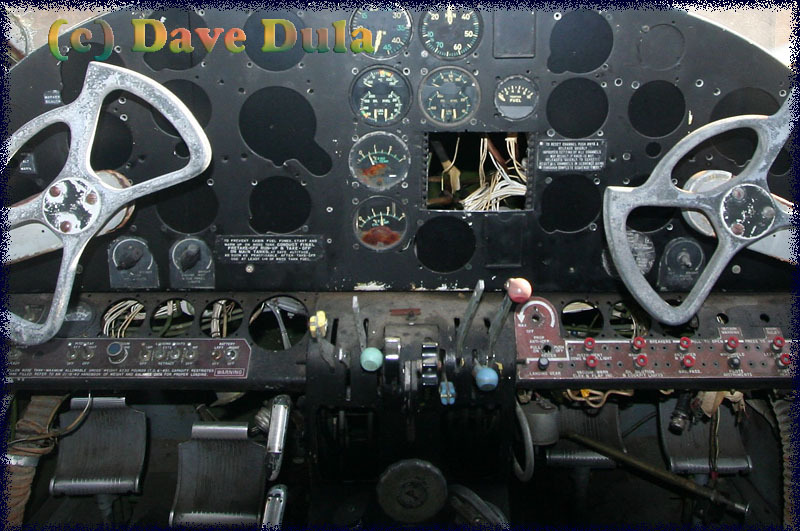 Paul remembers: "My first flight was with a Douglas DC-6, from Amsterdam to Salzburg with Transavia, in 1968. En route we encountered terrible weather, turbulence and 'barf bags' were plenty in use. I think the trip took most of 3.5 hours and we arrived safely. The return flight had a delay of almost a day; an engineer with spare parts had to come from Amsterdam to fix the aircraft. The engineer remained on board and I talked to him during the flight. He told me the DC-6 was almost indestructible, but he wasn't satisfied with the time Transavia spent on maintenance on the Six (he said there were only 2 ground engineers to work on the DC-6 at Amsterdam). Funny thing was I encountered his collegue many years later. This photo of OE-LHT was taken with a Pentax S1a." "Here are some photos for you. They told me they were here at Aurora State Airport (Aurora,OR - KUAO) for a C check. We also have a metal shop that may have done some work. 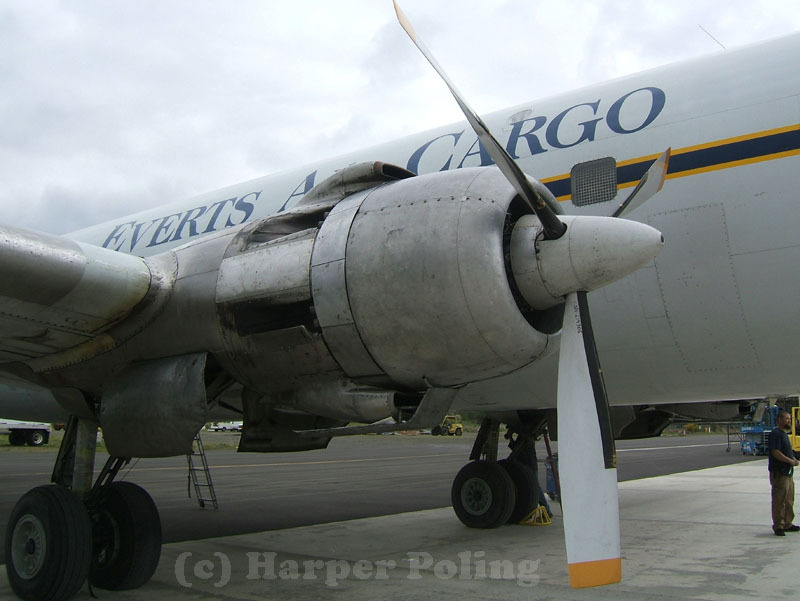 I used to ride in the Navy R4D's and in DC6's with the airlines back in the 1960's. I also got to land a Super Connie once!" 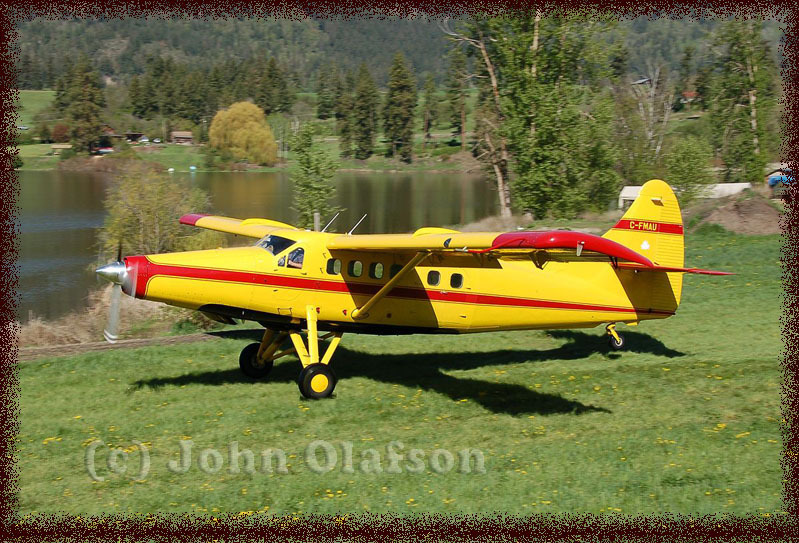 He has a neighbour who owns an interesting bushplane.. C-FVNU is owned and flown by Jerry and Susan Wiebe; it is a Piper Replica "Pacer Express" which was built by Stan Kowaski in 1995 (all data from the Transport Canada website). I know next to nothing about this (type of) aircraft, except that it has a piston engine and has msn 001. Is this former Piper PA.18 150 SUPER CUB msn 18-8515, which at one time was also C-FVNU...? Below some photos from Phil's (and VNU's) habitat... And Phil also offers a further explanation on this bushplane. 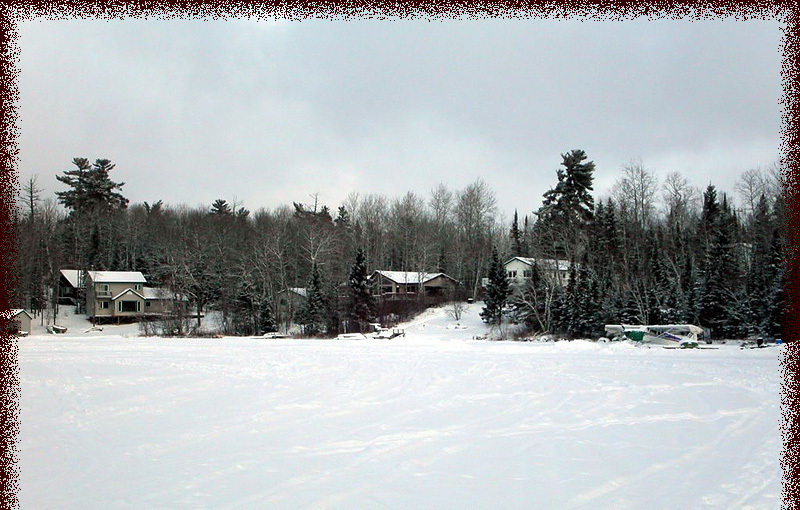 "The owner operates a fish bait company which operates from May-September. He has a minnow license for a couple of small lakes about 1/2 hour north of Kenora. 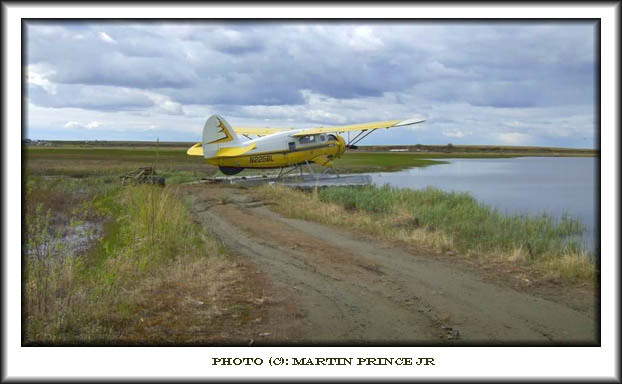 When he started in 2001 or so, he flew a Husky Cub (modified Piper Super Cub) but that plane did a forced landing into a swamp in the winter and could not be fixed and flown out. He bought the Piper Express the following spring. 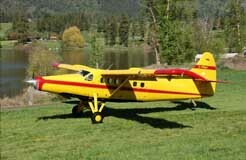 C-FVNU started life as a Piper Pacer but has been modified to be a superior floatplane called a "Piper Express". Modifications were done in Manitoba. It is hard to see but the aircraft also has modified wingtips. You will notice a changed cowling. When it was built it was likely equipped the original Lycoming 125hp. 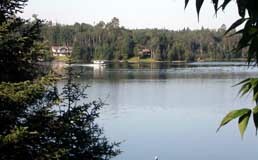 When it arrived at our lake in 2003 it had already been modified to a Lycoming 160hp. Since then that engine has been replaced by a 180hp and fine pitch prop which provides significant performance gains. To give an idea of VNU's performance: from our shoreline directly across to the opposite shore is 1/2 mile (give or take 25 feet as measured by my GPS). 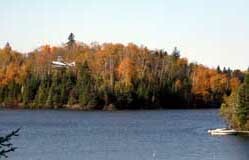 VNU can land westbound over our cottage or takeoff east or west and clear the trees by about 50feet. Quite the sight! When VNU is at gross takeoff weight he usually takes off on a diagonal which offers about 3/4 mile of open water. Its takeoff sightlines are not great as boats around the far point may not see him! 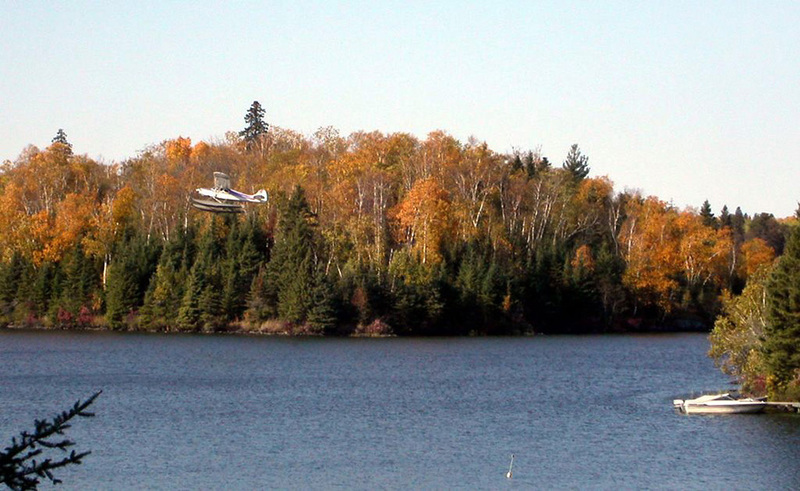 As a rule when he lands, he does a high speed circuit around the lake to choose his approach. 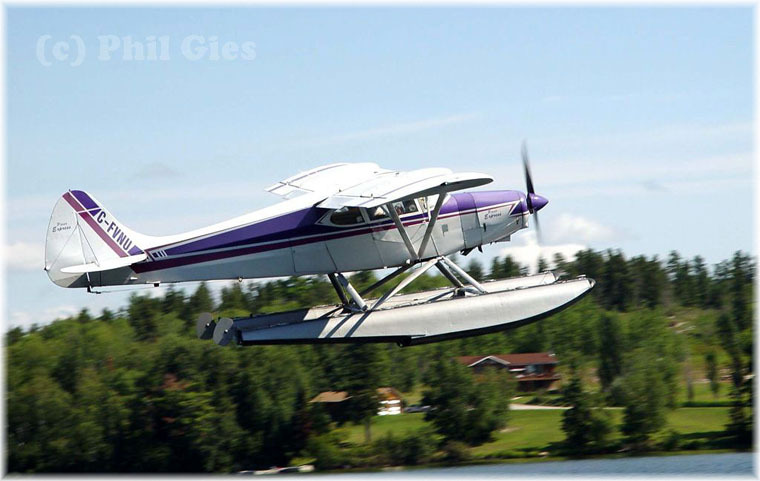 I really love floatplanes so for me, it doesn't get much better." 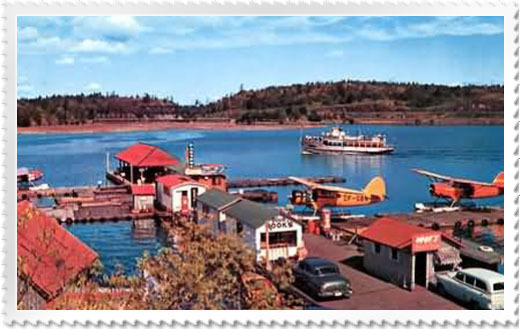 Phil Gies, noticing my webpage about a visit to the Kenora Seaplane base (Ontario), sent me this 1953 postcard... Two Noorduyn Norseman floatplanes can be seen awaiting a next assignment. Mike Leary sent me some interesting images, he took them some time between May - July 2000. 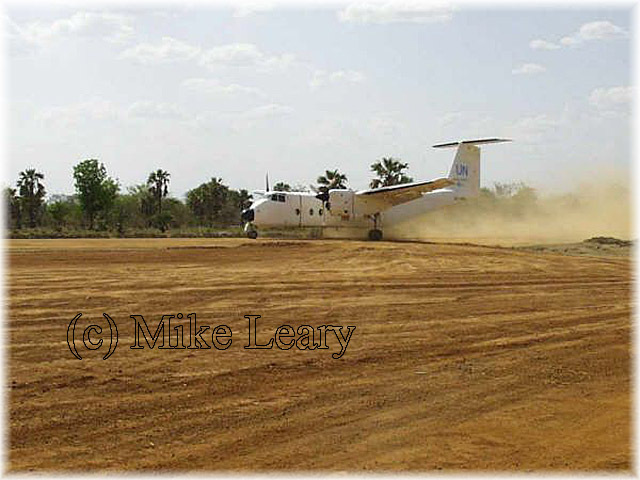 The DHC-5 Buffalo flew in from Lokichokio in NE Kenya (see the film 'Blood Diamond' for interest sake) on a supply run. 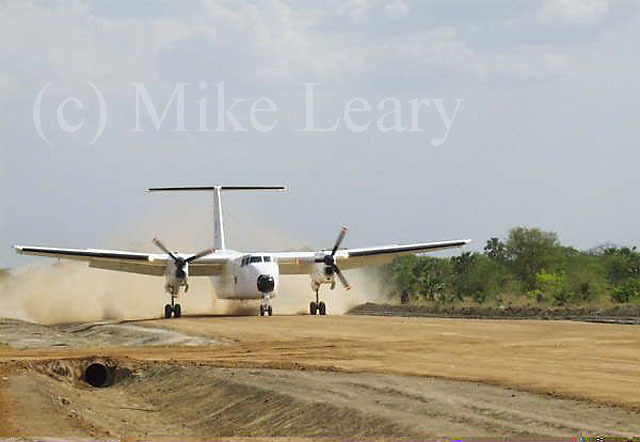 The Rumbek airstrip had been out of action for several years Mike corked at installing proper drainage and resurfacing, using local material. 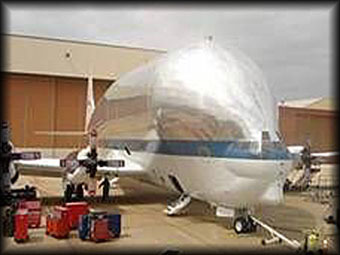 "NASA brought its Super Guppy to Tinker AFB in mid-April so that maintainers here could inspect the aircraft and perform some repairs. Project planners estimate it should take about 14,770 hours to inspect and fix the plane, which has never been fixed prior to this. That equates to an Aug. 22nd goal of completing inspections and some repairs, with a drop-dead date of Sept. 29, unless workers find something that requires extensive repairs." 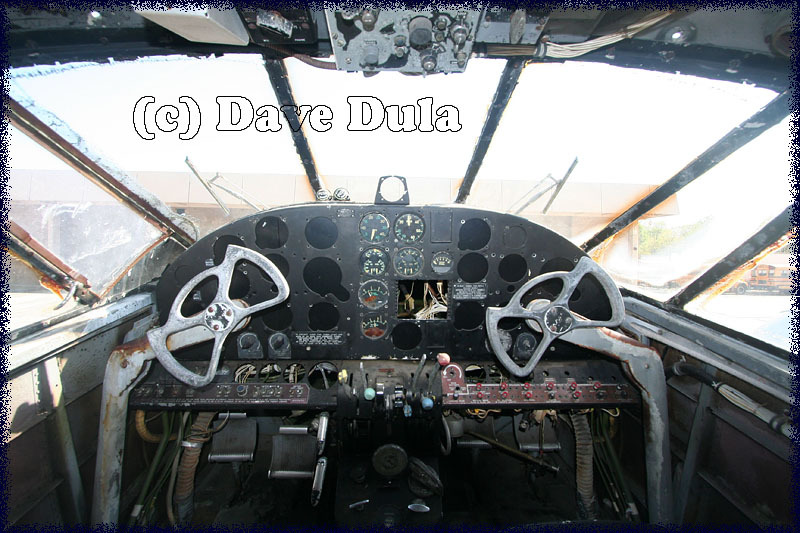 I was at the Minter Field air show in Shafter,CA this past Saturday (19Apr08) and took some pictures of Wade Eagleton's B-26C Invader that used to be with Air Spray (C-FAGO). Now registered (although it isn't on the plane yet) as N5625S, I have enclosed a more detailed closeup of the artwork than you have on your website. 1951-56 67th tactical recon wing japan&korea "dragon lady"
Near the cockpit is written: "Pilot Chris Baldwin"
I have been visiting your website for years and imaging my suprise, when I was trying to identify SNB-2 39208, it showed up at your website! I had been trying to identify that aircraft for 6 months, but there are absolutely no markings I could find on it. Then, low and behold, I found the 39208 number and found a matching hit on your website! See below images, including the serial number plate." 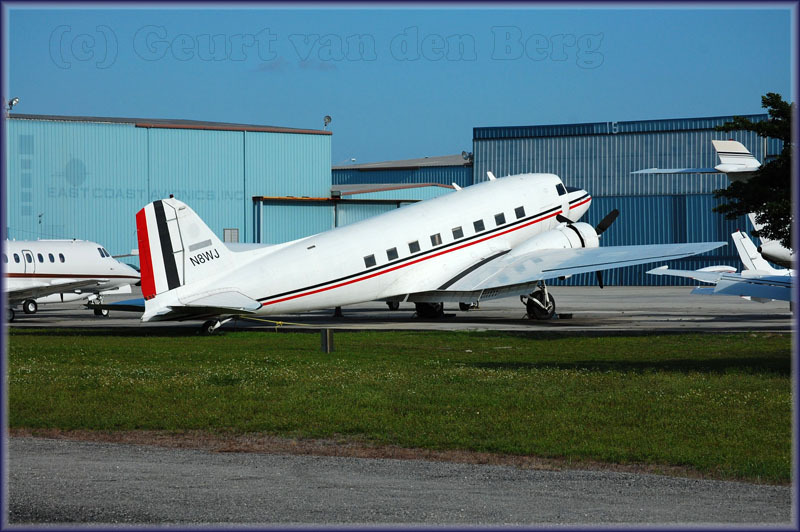 This Beech 18 has its full history on Photos by Friends & Guests (9), but in 2017 it changed owners through an auction on 'Govdeals', see Friends & Guests (48). "I saw Invader T-98 here in Winnipeg on the weekend (05+06Apr08). It looks beautiful, even if the markings are totally fictitious! Unfortunately, the A-26 never served in the RCAF or Canadian Air Force, but did a great service in the Fire Fighting area." And indeed, while on my visit in 2006 it was still present in the familiar yellow Air Spray livery, during 2007 I noticed it had gone missing! 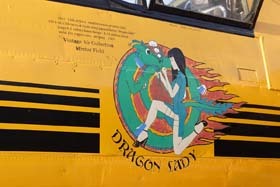 May she have an active and long warbird career ahead of itself! 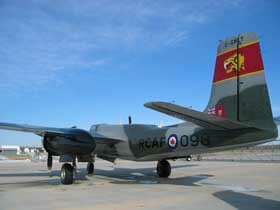 C-GWLT was registered to Air Ross (1980) Inc. (care of Ross Robinson, Calgary,ALB) 27Mar08. He wrote: "I had a look at some old black & white negatives and found a few Aeroflot IL-14 aircraft, the pictures all taken at Stockholm-Bromma airport, perhaps these photos can be of interest." "CCCP-L1576 c/n 147001315 and CCCP-41869 (c/n ?) 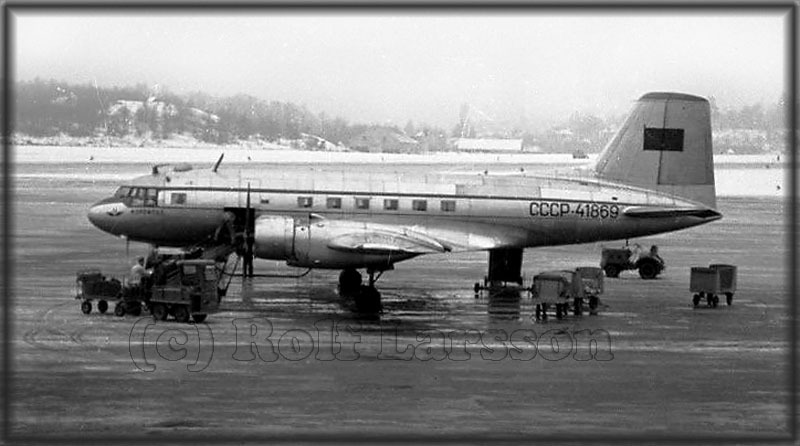 were both seen on the regular Aeroflot service to Bromma, both pictures were taken sometime between 1959-1961. 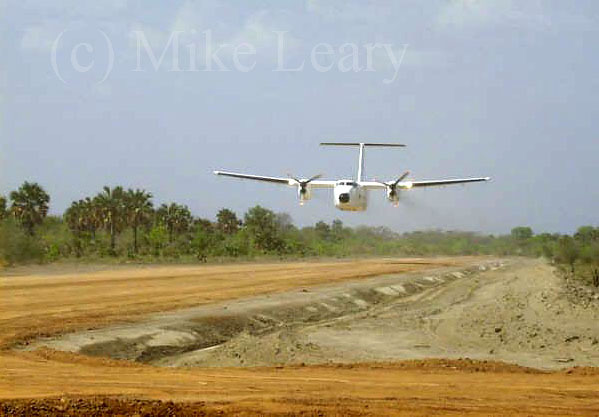 Any info regarding the missing IL-14 construction numbers would be most welcome!" Peter Hillman and Aad van der Voet both provided identification for CCCP-41869, being c/n 146000840. Unfortunately CCCP-61703 remains a mystery to this day! "CCCP-41869 (c/n ?) at Bromma, photo dates from sometime between 1959-1961." 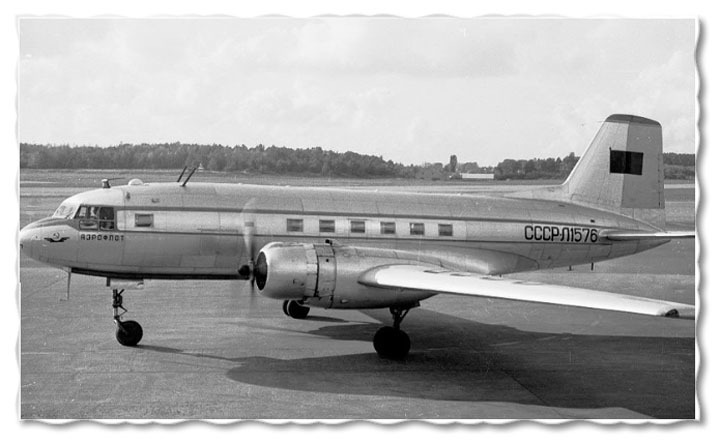 "CCCP-61703 (c/n ?) apparently performed an odd cargo flight, the picture was taken in 1959." 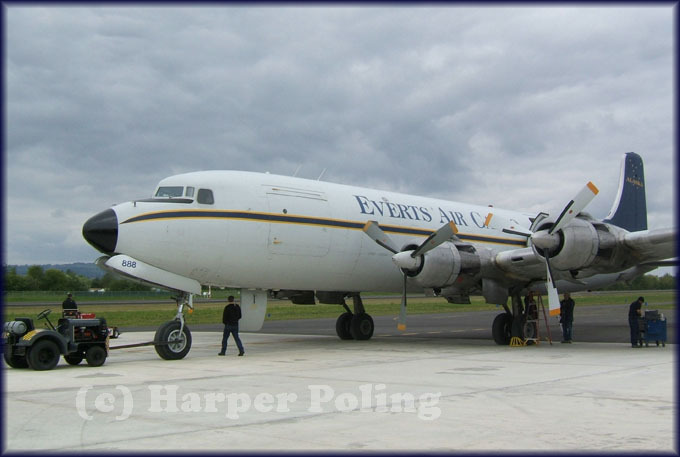 Steve Kinder caught this Avro (Hawker Siddeley) 748 S2-AAX (c/n 1767) (©) at Blackpool airport (BLK/EGNH) on 08Apr08. For me personally, the HS.748 will always be associated with years of exchanging military aircraft slides with Harry Holmes during 1970s and early-1980s; he was a Sales Rep for the HS 748. We lost contact when I stopped trading and lost interest in aviation photography for a number of years. The 'Budgie' is a dying breed, its number of operational airframes dwindling fast. Richard Church, acknowledged expert on the Hawker Siddeley 748, wrote a report in Propliner 113 (Winter edition 2007) of those still in operation in Canada and listed the following companies: Air Creebec (1994) Inc., Air Inuit, Air North, Bradley Air Services/First Air, Calm Air and Wasaya Airways. When Emerald Airways saw its AoC revoked in 04May06 by the UK CAA all its aircraft, including G-BGMO, were grounded. The latter now has been reregistered to S2-AAX and seems to be heading for a new future in Bangladesh. 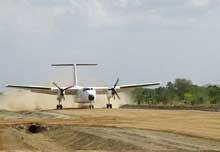 Richard Church revealed "S2-AAX is due for delivery to Easy Fly Express Ltd, a new Bangladesho cargo carrier." Timo de Vries shot this impressively decorated Antonov An-12 EW-266TI at Maastricht (Netherlands) on 29Jan08. Since I am a great fan of this rugged freighter, I am glad they find ways to continue to operate into the EU bastion! 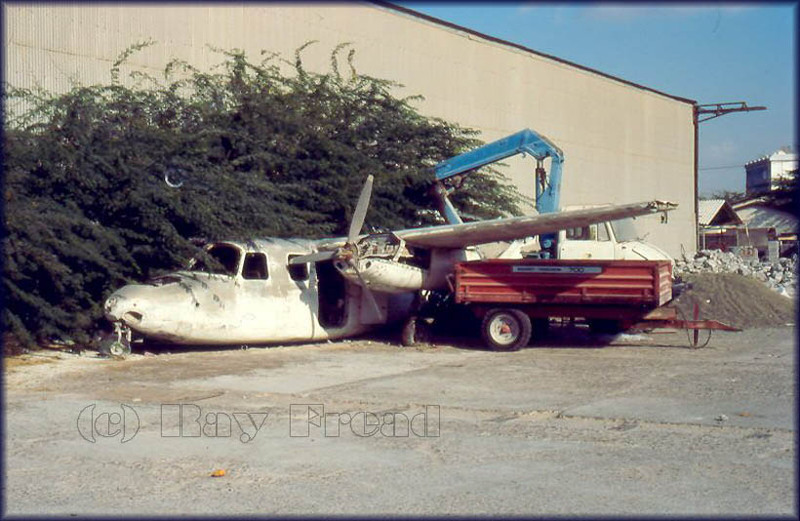 This particular Antonov 12 was almost damaged beyond repair in an accident at Baghdad on 09Mar05, when the right wing and no.4 engine hit the runway, but fortunately it was repaired. Like I said; a rugged freighter! Patrick 'Pat' Kilkenny shot this fine winter study of Douglas DC-3 N85SA at Fremont,OH on 09Mar08. N85SA (c/n 11637) has been here at Fremont for at least 14 years now, owned by E.E. 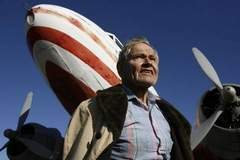 'Gene' Damschröder who owns the entire airport (and the Flying Club too?). 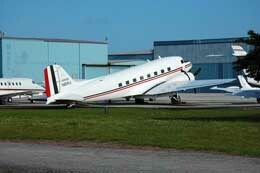 Another DC-3, N137PB, seems to languish here too. 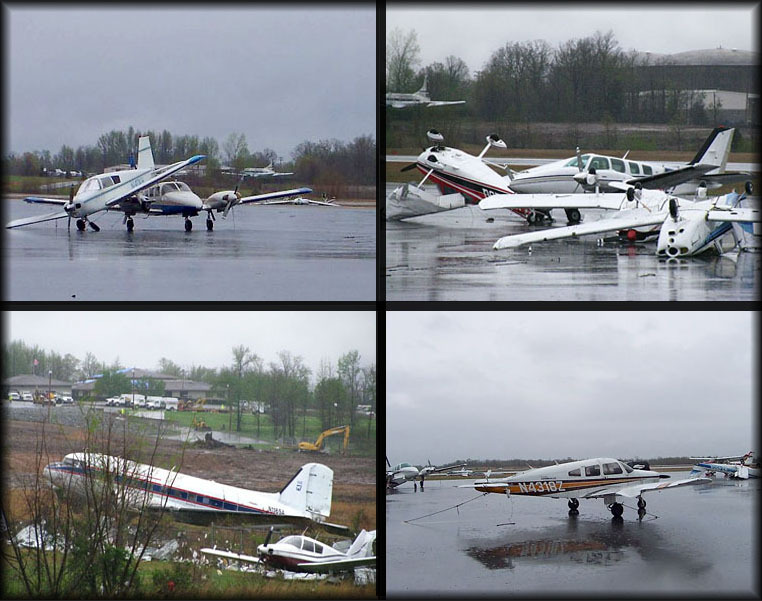 FREMONT - A single-engine airplane crash near Fremont Airport June 8th killed 6 people, including the pilot who was a prominent former Ohio legislator and who was offering plane rides at a charity breakfast. Killed in the 1 p.m. crash were Gene Damschröder, Sr., 86, of Fremont; Bill Ansted, 62, and Allison Ansted, 23, both of Lindsey; Danielle Gerwin, 31, and Emily Gerwin, 4, both of Gibsonburg, and Matt Clearman, 25, of Maumee. According to troopers at the Ohio Highway Patrol post in Fremont, the Cessna U206C Super Skywagon crashed shortly after take-off into a residential area in Ballville Township east of the airport, killing all onboard. The flying days of Gene Damschroder dated back to World War II. Don McDonald sent me this photo which he took while travelling on Vancouver Island (09Mar08). 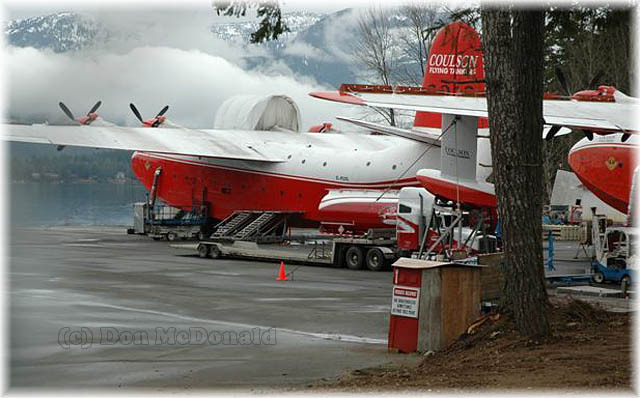 It shows the two Martin Mars airtankers of 'Coulson Flying Tankers' at their base on Sproat Lake. Note no.3 engine of C-FLYL is under a hood, for maintenance; C-FLYK sits on the right. 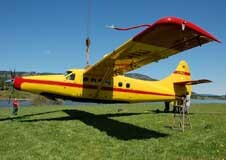 John Vogel noticed my interest in vintage aircraft and airtankers, so he sent some images along. 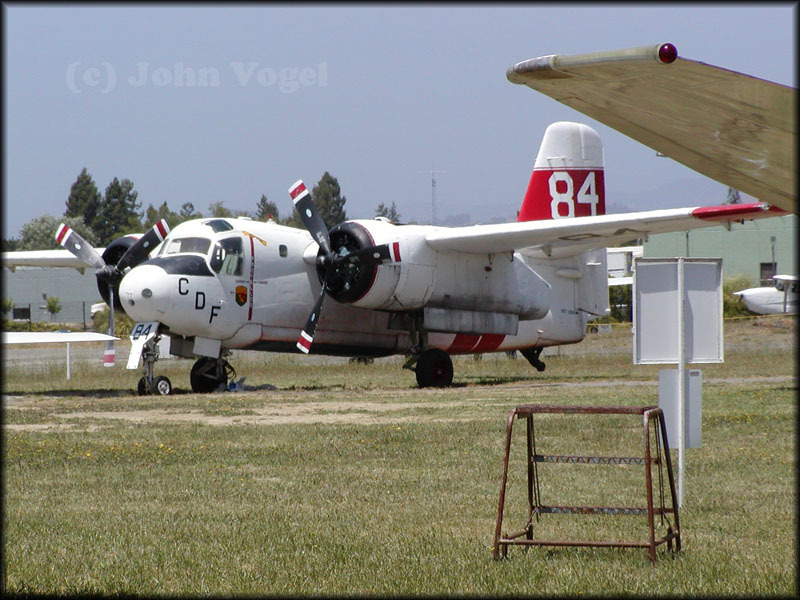 This photo of N446DF was taken at Mather Field,CA in May 1996. 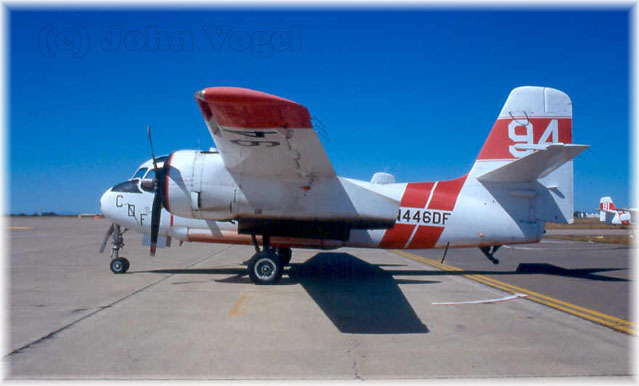 From my files I have that this is Grumman S-2A Tracker, c/n 175 ex/ BuNo 133204. 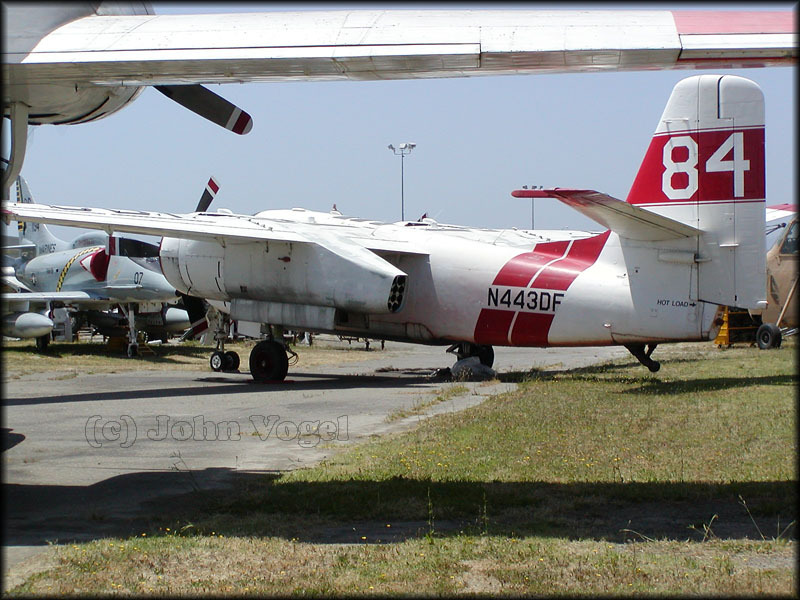 John wrote about this image: "There should be some S-2 aircraft preserved at Weed Airport, California since August 2005, but I am not really sure which aircraft might be there. I have noticed that the CDF has, from time to time, changed some of the tanker numbers on the S-2's: e.g. this photo shows 2 aircraft with tanker number 95!! One of the aircraft is N447DF, the other is N406DF. 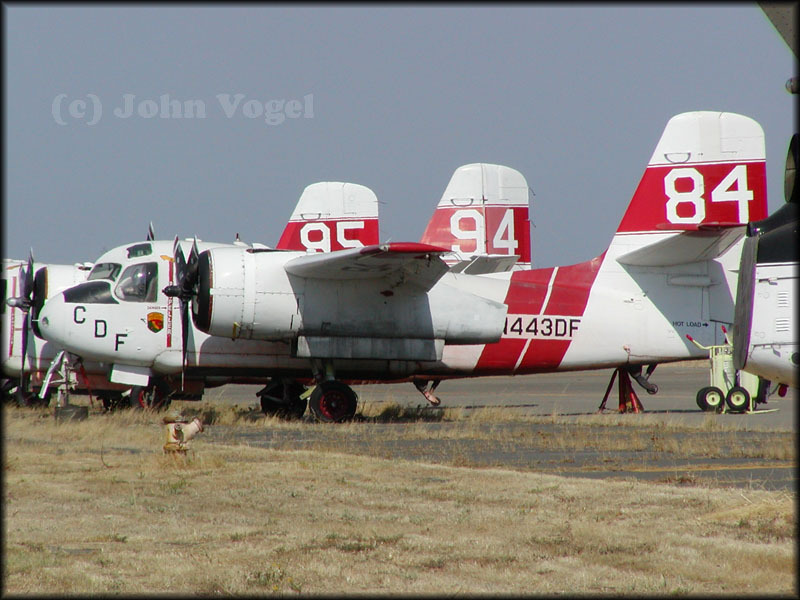 And I have pictures of N406DF as tanker 73, tanker 74, and tanker 95. 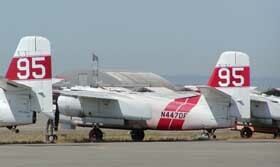 And N447DF as tanker 93. These are all the older S-2's, not the S-2T's (which is the only model the CDF now uses)." Photo taken at McClellan Park in August 2007. 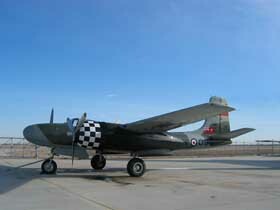 "John is correct, the Grumman Tracker at Weed is not N446DF. N446DF / '94' was withdrawn from use in 2003 or 2004, and placed in storage at McClellan Field, Sacramento, CA. 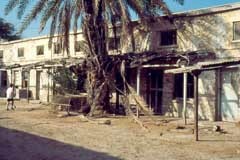 It was seen there in May 2005 and again in Jan 2008 in good condition. 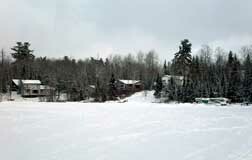 It was still there by Nov 2008. 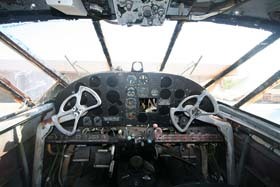 In Mar 2009 it was sold in an auction to Rick Clemens of the Cactus Air Force LLC, and may by now have been moved to their base at Carson City, NV. When N446DF was withdrawn from use (in 2003 or 2004), its tail code '94' was transferred to N404DF, and this is the mysterious Tracker at Weed, CA! 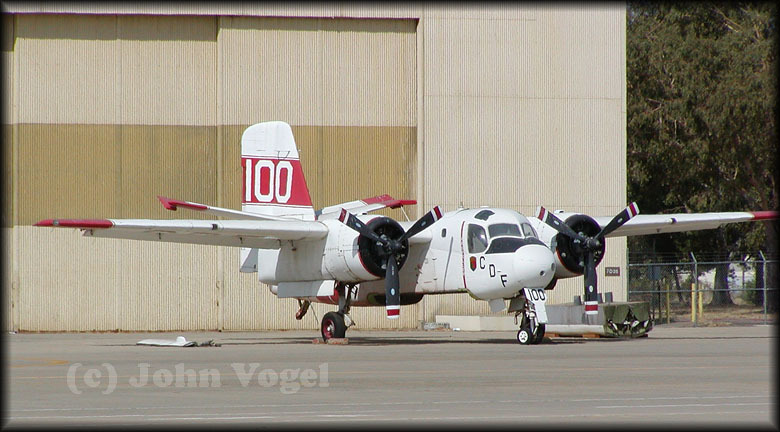 N404DF / '94' arrived there on 29Jul05, during the dedication ceremony of the Siskiyon Firefighter Memorial, of which it is now part. At the time there were plans to add two more aircraft to the memorial, but money ran out (doesn't it always...?) and N404DF will now remain alone." 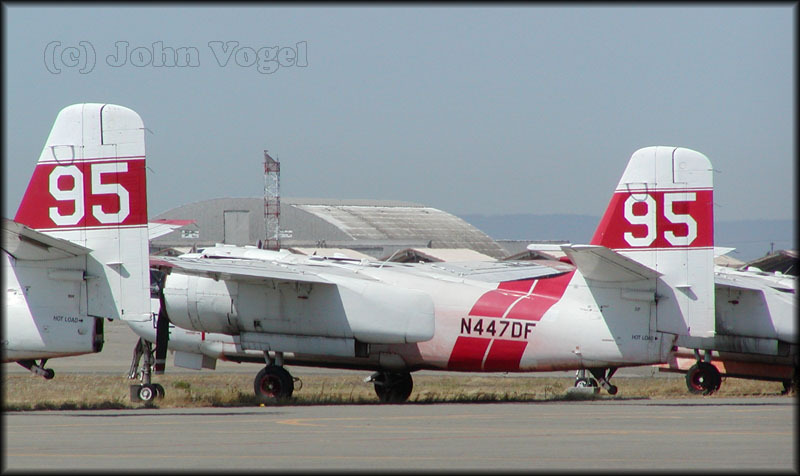 Here are some more air tanker pictures, this time of N443DF (c/n 195). Picture N443DF-1 is a scan from a slide, taken at Mather Field in February 1996. The tanker number is 71. Picture N443DF-2 is a digital picture taken at McClellan Park - the former McClellan AFB, and now the home of the CDF air tanker fleet (during the winter months) - taken August 2006. The tanker number is now 84. Pictures N443DF-3 and -4 are digital pictures taken in May 2007, and show the tanker at the Pacific Coast Air Museum, Santa Rosa, California. 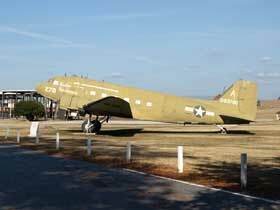 It was flown to the Museum in November 2006. Top picture of Grumman S-2A N436DF (c/n 445) was taken at Rancho Murietta, California in July 91. Note that the tanker is in the old CDF yellow/green color. Below pictures of N436DF was taken at Mather in August 2007. It appears the doors in the bottom of the aircraft have been removed. The registration had been painted over. 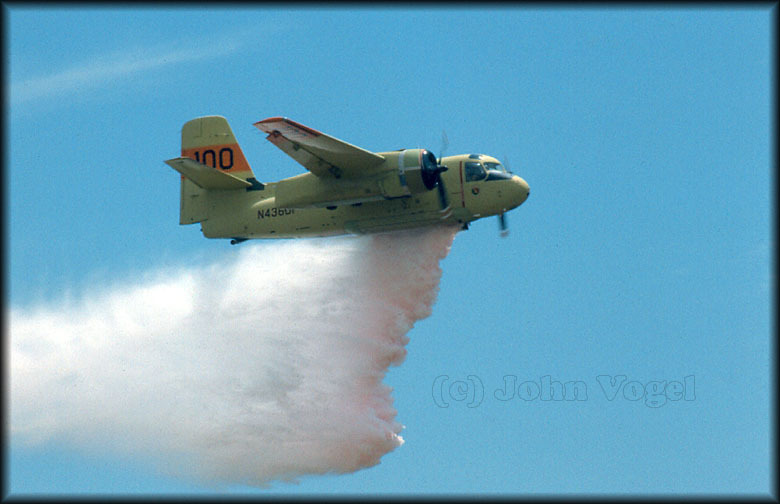 On 13Aug08 the USFS commemmorated the 50th anniversary of the birth of aerial firefighting in Willows,CA. 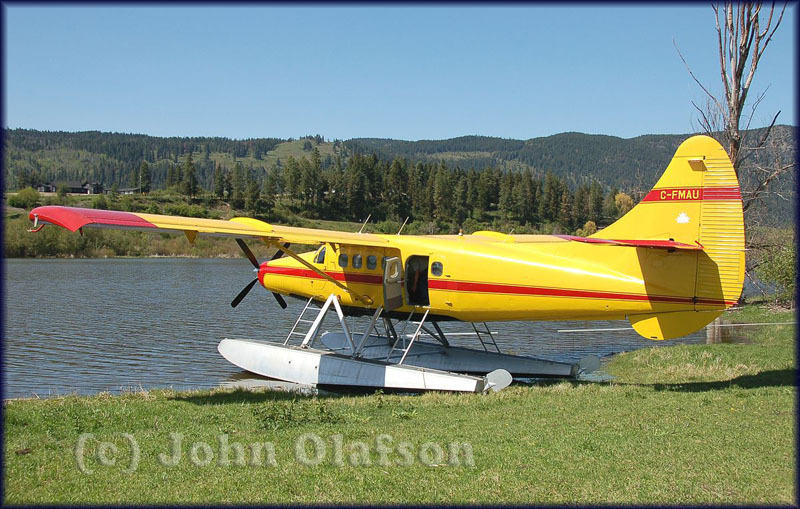 On that date, in 1955, Vance Nolta flew a modified Stearman biplane over the Mendenhall Fire in Mendocino National Forest (MNF) and made 6 water drops. The following year, MNF Fire Control Officer Joe Ely was able to enlist 7 local agricultural operators to convert their biplanes to fire bombers and stationed them at several small airports within easy flight range of key MNF fire danger zones. That is how history was made.